Remember a year ago when there was a debate over some dress going around the internet? Was it white/gold or was it black/blue? Not wanting to re-hash that here, yet this photo reminded me of that. Whether it was a scientific phenomenon or simply individual perception, who knows and who cares? This photo has given me a chance to perceive things in a different way. I am enjoying our “room with a view,” which offers plenty of natural light and a “rock garden!” Rock garden, you might be wondering, are you nuts? I realize it’s a stretch, and I am choosing to frame what I’m seeing in a different light, therefore, yes, it’s a rock garden, and a beautiful one at that! 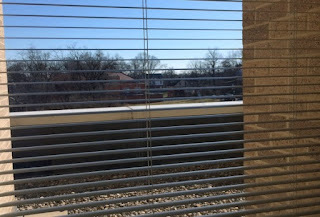 I can’t tell you how many admissions we’ve had where the only sight from the window is a view to the other side of the building, where I can spend the entire day not knowing what the weather is, or what the sky looks like. Who knows how this has played into the often-seen confusion of days/nights for Ethan. All I can say is the room we are in is tremendous and brings me such peace of mind. 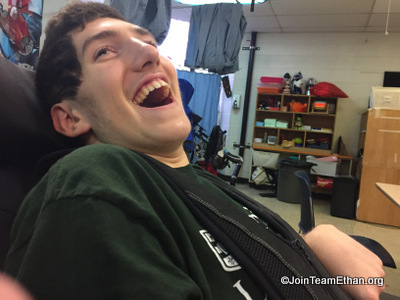 Moving on to Ethan…he is in his fourth day post-surgery and recovering in the expected ways. Days one and two were spent in the PICU and the pain was minimal, as he was still coming off of the anesthesia. By mid-day Wednesday we were transferred from the PICU to the surgical recovery floor. Also on days two-three, we were reminded of just how much this surgery hurts Ethan! Realizing this is the fourth major insult to Ethan’s abdominal region (I could get graphic, but I won’t), we have learned what pain meds reach him the best and how to deliver them in a way that keeps us ahead of the pain, rather than chasing it down when it’s spiraling out of control. Today has been great so far, from a pain standpoint. Ethan has been up in his wheelchair for most of the day, which is so good for his respiratory health, resting comfortably and peacefully, and not needing the pain medications with the same frequency. His surgical team is pleased with his progress and we head into the weekend with positive thoughts for continued rest and recovery.